It puts the aspirations and needs of those who produce, distribute and consume food at the heart of food systems and policies rather than the demands of markets and corporations. It defends the interests and inclusion of the next generation. It offers a strategy to resist and dismantle the current corporate trade and food regime, and directions for food, farming, pastoral and fisheries systems determined by local producers and users. Food sovereignty prioritises local and national economies and markets and empowers peasant and family farmer-driven agriculture, artisanal – fishing, pastoralist-led grazing, and food production, distribution and consumption based on environmental, social and economic sustainability. Food sovereignty promotes transparent trade that guarantees just incomes to all peoples as well as the rights of consumers to control their food and nutrition. It ensures that the rights to use and manage lands, territories, waters, seeds, livestock and biodiversity are in the hands of those of us who produce food. Nyeleni Europe – the widest international movement aiming to realize food sovereignty in Europe. Boerengroep is part of the Dutch Delegation of Nyeleni Europe Forum for Food Sovereignty that will take place in October 2016, Romania. Via Campesina – the largest international peasant movement, which launched the concept of Food Sovereignty in 1996 during the FAO World Food Summit in Rome. La Via Campesina is an international movement bringing together millions of peasants, smalland medium size farmers, landless people, rural women and youth, indigenous people, migrants and agricultural workers from around the world. Built on a strong sense of unity, solidarity between these groups, it defends peasant agriculture for food sovereignty as a way to promote social justice and dignity and strongly opposes corporate driven agriculture that destroys social relations and nature. See also their flyer. List on Food Sovereignty here..
Food Sovereignty: Towards democracy in localized food systems. FIAN International. Here..
Food Sovereignty comes of Age. Africa leads efforts to rethink our food system. by UK Food Goup. Download here.. Developing and strengthening the concept of peoples’ food sovereignty. Read here..
Peoples’ Food Sovereignty Statement. Read here..
Food Sovereignty Framework: Concept and Historical Context. Read here.. Via Campesina, 2003. 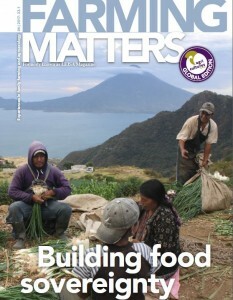 Food Sovereignty: Global Rallying Cry of Farmer Movements. Read here.. GRAIN, 2005. Food Sovereignty: turning the global food system upside down. Read Here..
Why a convention on food sovereignty. Read here.. Put food sovereignty at the core of the EU CAP. Brussels, 2010. Download here..
NYÉLÉNI 2007. 27 February 2007 Declaration of the Forum for Food Sovereignty, Nyéléni, Sélingué, Mali. the article by Via Campesina Over 15 years’ struggle for recognition of peasant rights in the international human rights system. Cetim.ch has been committed for many years to better protection and promotion of peasant rights, alongside La Via Campesina and FIAN. They have published a series of documents on the right to land, economic, social and cultural rights and civil and political rights. VIDEO Hands on the land for food sovereignty and climate justice. Frontline communities and social movements around the world explain why we need to keep our hands on the land for food sovereignty and climate justice! They talk about the false solutions they are presented with against climate change, and the real solutions and ways forward that small-scale food producers promote. VIDEO What does it mean to be peasant in Romania? With half of the EU’s peasants, Romania is the ideal place for the largest pan-European food sovereignty forum in history. Hundreds of farmers, peasants, pastoralists, fishers, rural youth, environmentalists and others gathered in Cluj-Napoca between the 25th and 30th of October 2016 to build common strategies in order to re-organise the way we structure our society around food and agriculture.